In 2006, the then UN Secretary-General, Kofi Annan, called on the Council to lead the international community from “the era of declaration” to “the era of implementation.” As the Council marks its 10th, and the two human rights Covenants their 50th anniversaries, there are important signs that UN Member States are increasingly turning their attention to the question of implementation, and how best to support it. 2016 therefore offers an important opportunity for a process of inclusive and collective reflection on remaining gaps, lessons learned, and best practices and how to replicate them. There are also signs that the international community is moving to strengthen its ability to use evidence of serious non-compliance with obligations under international human rights law – i.e. evidence of emerging patterns of gross violations of human rights – as an ‘early warning’ sign of potential crises, and as a signal that the UN should act to prevent further violations and any further escalation of the crisis. Yet while there appears to be broad agreement about the value of a preventative (rather than reactive) approach, and that the Council should be central to any UN prevention strategy, there is little agreement about what ‘prevention’ actually is – what it means in practice, what tools or mechanisms are needed to do the job, and how the role of the Council fits within the wider UN prevention architecture. 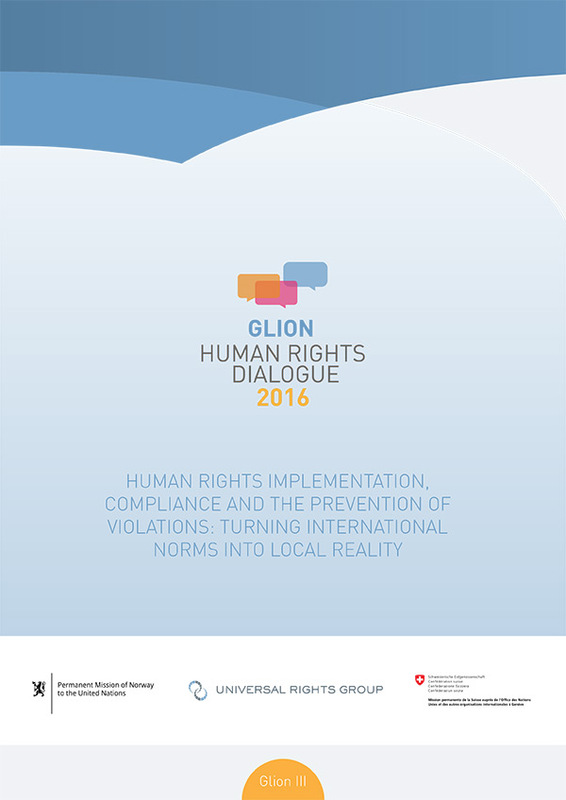 The third Glion Human Rights Dialogue (Glion III), organised by Norway and Switzerland, with the support of the Universal Rights Group (URG) and held from 3rd to 4th May 2016, provided a a platform for representatives of key parts of the international human rights system such as States, OHCHR, Special Procedure mandate-holders and members of Treaty Bodies, and NGOs, to discuss these important issues in an informal setting. Glion III adopted a ‘bottom-up’ approach to the issues of implementation and prevention. The report of the third Glion Human Rights Dialogue is an informal document summarising (in a non-attributable manner) some of the key ideas developed during the Glion retreat, and based on four policy dialogues which preceded it. The document does not represent the position of Norway or Switzerland, nor any of the participants, but rather is a non-exhaustive collection of ideas generated during those meetings. It is the hope of the organisers that these ideas and proposals will encourage and contribute to wider consideration by all stakeholders from all regions, thus making the Glion Dialogue a starting point for a fruitful and inclusive process. It is also the hope of the organisers that, where appropriate, States and other stakeholders will take forward useful ideas generated in Glion and thus contribute to an improvement in the Council’s relevance and impact in the field of human rights. What are the human rights priorities of world governments in 2017? Working Smarter for Human Rights: Are Digital Tools the Way Forward?